When you’re out shopping and want a snack, we recommend popping into one of the excellent sandwich shops in Leeds city centre to sate your appetite and give you the energy to carry all those bags! We’re lucky to have a few great options, but which ones do we rate highly enough to include in our definitive list? Let’s dive in and find out! One of our favourite sandwich shops in Leeds is Appetite Deli in Wellington Street, and there are plenty of reasons why! Whether you’re popping in for a takeaway or planning to sit down and eat, the staff are always friendly and welcoming. 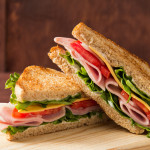 They’ll efficiently prepare you a fresh gourmet sandwich – either one of your own design or from the mouth-watering menu, but whatever you chose will be delicious! Riveresque is such good value that it’s hard to see how they make a profit! With a huge selection of sandwiches, wraps, baguettes and melts hot off the griddle, the only problem is making your mind up what to choose! If it’s a classy sandwich you’re after then Philpotts should be top of your list. Specialising in providing quality products for meetings and events, Philpotts also offer an individual service for walk-in customers that are second to none. Yes, you pay a premium for their sarnies, but they’re definitely worth it. Despite our love of independent shops, it wouldn’t be a definitive sandwich shop list without including Subway, would it? Both stores in Leeds do what they say on the tin and serve all your favourite subs with their trademark efficiency. All of the Pret stores are high-class establishments that make stopping by for a sandwich and a coffee a real pleasure, and the one located in Victoria Gate is no exception. What we love about Pret is their dedication to really good quality ingredients and the thoughtful little touches, like offering smaller sandwiches for those without huge appetites. Yes, we can safely say that when it comes to sandwich shops in Leeds, we’re blessed with a great selection – feel free to drop one off at the office for us when you come back for your car! If you’re looking for some thrill-a-minute driving on a budget and a motor you can do the weekly shopping in,…..
From 20th May 2018, it’s going to be a lot tougher to keep your car on the road because a…..